We just did a “second set of eyes” check up for a small business in our area. This made me think that, since we are at the half way mark of the year, this would be a good time to discuss our mid-year business review process. Just like we used to get in school, let’s give our marketing tactics, employees, financial agencies, systems and ourselves a letter grade. Marketing tactics: This is a great time to write them down. 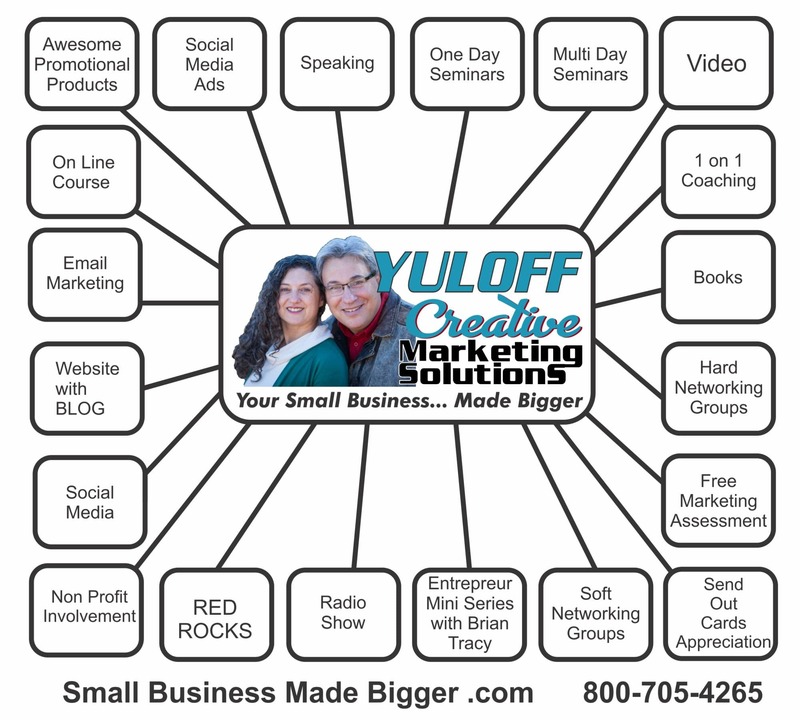 You may be surprised that you are doing more things than you think to market your business. I have added our wheel chart on this blog for you to see (if you opt in here or below, we will send you a blank one to fill in for yourself). Take the time to fill in all of your current marketing tactics (you may not need all the blanks this time, but over the years, you may find that you do need them all). Every place you put ads. Every place you volunteer. All the different on line and off line tactics you use to market your business. The next step is to grade them using the traditional A through F (do you ever wonder what happened to E?). This grade is completely subjective: Do you generate great relationships but few dollars? I make no value judgement. Does it generate a lot of referrals? How much time does it take from your month? Do you compare each with the number of dollars? Do you know what your greatest source of new revenue is? How often do you meet with each Employee? What kind of feedback loop is in place? How do you let them know the results of their feedback? How do you reward them when you put their ideas into action? How do you course-correct with them? For your staff in general, are there some you lean on for support or ask to do to much? Or too little? Are your Financial people responsive? How responsive? Do they bring up possible challenges and solutions?Or are they purely reacting to what you ask them? One of the hardest things to do is change accountants, bookkeepers and financial planners. It takes a lot of time to train a new group, so quite often we will just let things slide. Sharyn and I know this one from personal experience. The sad part of this is that though it is the hardest part of the company to make changes in, it is also one of the most very important ones. We suggest that from time to time, you take a meeting with others in this field to see what they know and get recommendations. When a client or prospect calls, how is the call routed and how soon is it answered? How do you schedule work? We had one client who did the jobs that brought him the most profit first and was losing a lot of smaller clients that on a percentage basis had a larger profit. How quickly do you send out invoices? How do you collect and deposit money? An incredibly successful friend, Rickey Gelb, makes sure that money is deposited every day, no matter how large or little the amount is (yup, we do this, too). How do you follow up? Do you use an electronic process? Are you using “rubber band marketing?” Are you using a physical filing system? White board? SendOutCards greeting cards? How do you schedule times to work with clients? We have a certain amount of time we speak to clients then we have to do some work, for example, design ads or social media pages. What expenses take the most cash flow? How does your company brainstorm and solve problems? Once you brainstorm, what are you doing to make sure the majority of your time and effort go toward it? WOW! That was a lot to cover, right? The best way to remember to fix your systems are to remember a pneumonic device I learned a long time ago for the word SYSTEM. It stands for: Save Yourself Some Time, Effort and Money. It all makes more sense now, right? Lastly, let’s take a look at Ourselves. This might be a hard one because we are working so many hours every month and we are the point people for so much of that gets done and does not get done. Is your To Do list too long? Perhaps you need a NOW list and a TOTAL THINGS To Do list. Check out things that never get done. Perhaps you need to delegate or outsource them? Are you working with the kind of ideal clients you want to work with? The first thing we do with new clients who work with us is go through that decision making process. What tasks get you unfocused? Or, you know, make you want to take a nap instead of doing the work? Same thing with clients. Are there some to whom you should say good bye? How are you being held accountable? And finally… Are there things that waste your time yet still garner your attention? This exercise is difficult. The good news is that as you go through it again and again, it will be easier. And think how incredible it will be to get rid of the weaknesses and inconsistent behaviors which can slow us all down. We would love to help you through the process. If you go to www.BoxFullOfMarketing.com and take the short assessment, you will be placed in to our calendar for a decisive 30 minute phone call where we can begin to get you on the correct path. For clients, we schedule regular check ups on the health of their business, and you can get started just by being willing to change habits and some ways of operating, and thinking.